Derivatives giant CME Group and the UK’s Royal Mint revealed details about their plans to bridge the worlds of gold and blockchain today at CoinDesk’s Consensus 2017 conference in New York. Last year, the two institutions announced plans to put gold on the blockchain to streamline trading, with physical gold being represented by tokens called RMGs (short for Royal Mint Gold). The Royal Mint said in April that it had begun testing the system. Those involved with the initiative discussed plans to secure the digital assets that would be created in the new system. 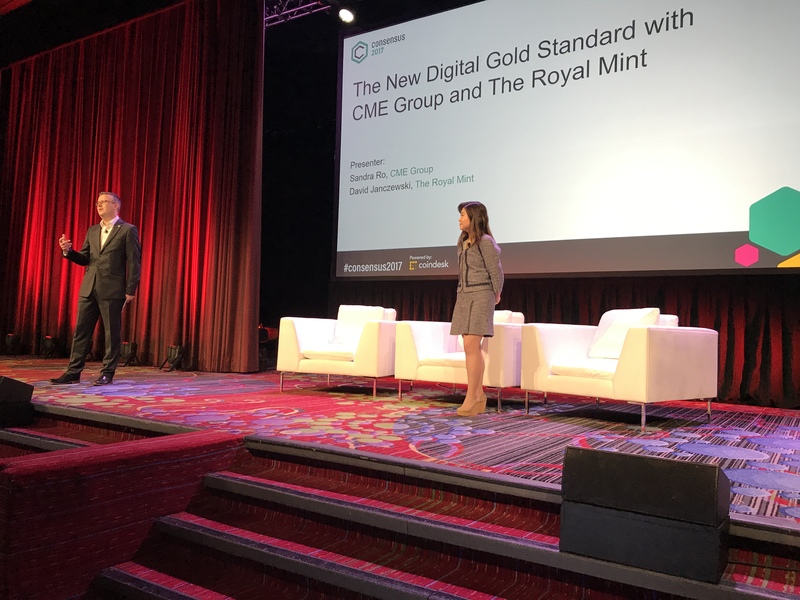 David Janczewski, head of new business and strategic intelligence at the Royal Mint, along with Sandra Ro, head of digitization at CME, talked about plans to store the funds in cold storage. As Ro described, CME will be working with bitcoin startup BitGo to design the digital wallet that will store the RMG tokens. Additionally, Ro touched on the permissioned blockchain that CME is building. “We are building out some infrastructure, because we want this to trade. And we want to make this as frictionless as possible for our institutional clients,” she said. She went on to say that, when it comes time to issue the gold-backed tokens, that will be a responsibility held solely by the Royal Mint. CME is currently developing the platform on which the tokens will trade, according to Ro. That system is currently undergoing alpha testing, and the derivatives firm is working with a small group of clients to test it. As part of that process, CME has also partnered with AlphaPoint to build out a “robust trading system”, according to Ro. And while she didn’t offer a firm launch date, she indicated that more details on this front would be made public in the months ahead. Disclosure: CME Group is an investor in Digital Currency Group, of which CoinDesk is a subsidiary.